Bill Miller wasn't exactly unheralded when he arrived at the University of Miami when he arrived in 1958, but All-District honors at McKeesport H.S. Pa. did not predict a career in which he was a two-time All-American. Miller gave Hurricanes fans a preview of his football prowess as a freshman when he caught the first forward pass of the game against Florida's "Baby Gators" in a 14-0 win. As a sophomore Miller caught 33 passes for 395 yards and one touchdown to rank him 5th nationally in receptions for the year and broke a one-year pass reception record at U.M. Miller was accorded honorable mention All-America status for his sophomore antics and then went on to become the Hurricanes first two-time All-American his junior and senior seasons. Miller upped his receiving yardage to 413 yards his junior season, with 5 touchdowns. He was the major factor for UM's victory over Notre Dame that year, a 28-21 win. His senior season the caught 44 passes for 648 yards, both one year marks at UM. He also caught a single game record of 9 passes against Northwestern University. 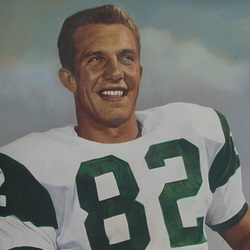 Following his stellar career with the Hurricanes Miller wasw dreafted by the Oakland Raiders, where he als had a stellar career in which he caught two touchdown passes in a Super Bowl game. Bill has said he will always savor his time as a Hurricane where he is still listed in the record books.